William Witney was a workhorse. The list of his credits includes over sixty movies, and dozens of TV shows. Witney used his considerable skill as a craftsman to jump from one genre to the other, starting with serials, moving into features with westerns, taking on crime films, JD flicks and even fantasy. While many of the films he directed are routine action movies, they’re generally made with a smooth professionalism that could transform paper thin scripts into solid entertainment. And when he got hold of a good script, he knew how to run with it. Barry Shipman’s screenplay for Stranger at My Door may be the best material Witney ever got ahold of, and he shows how far he could go. On most of the projects he directed, Witney was a hired hand. But apparently he felt a special connection to westerns, and this connection is palpable in Stranger. One of the things that made the genre so appealing to audiences was a straightforward morality that boiled everything down to clear cut choices between right and wrong. You always knew who to root for. But the script for Stranger goes deeper than that. It shows how hard making that choice can be. The movie kicks off with a bang, throwing us into the middle of a small town bank robbery and the ensuing gunfight. The outlaws ride their horses past the city limits, divvy up the loot and then scatter. But after the others ride off, the leader discovers his horse is lame. There’s no way he can make a speedy getaway. He runs into a boy who helps him with his horse and invites him home, where the boy’s stepmother welcomes the stranger warmly. But when the father returns, he quickly realizes who their guest is, and this is where it gets interesting. The father is a preacher, and he lets the outlaw stay, promising not to reveal his identity. You see, the preacher is determined to save this man’s soul. At this point you might be thinking that the film was going to be a moralistic drag, and you’d be so wrong. This is where Witney goes beyond craftsmanship into artistry. His approach is so straightforward, he stages each scene with such graceful simplicity, that the film never feels anything less than honest. Instead of trying to jack up the tension with histrionics, for the most part he keeps the actors under a tight rein. In a genre that was largely built on melodramatic cliches, these people seem real, their emotions ring true. As the outlaw, Skip Homeier starts out a little shaky. But his performance comes together, and by the end he’s completely convincing. Macdonald Carey is excellent as the preacher who is determined to save this man’s soul, though he slowly comes to realizes how great the cost could be to himself and his loved ones. Child actors can sometimes be unbearably cute, but Stephen Wooton does a good job as the pastor’s young son. The standout performance, though, is Patricia Medina as the stepmother. As a woman in a western, she’s given a wider range of emotions than the men, who mostly play it close to the vest. When the situation starts spinning out of control, the stepmother is the only one who’s allowed to let herself go, to raise her voice and let the world know that she’s angry and afraid. Unlike many westerns, the script lets her express her emotions without becoming an irritating cliche. Medina plays it to the hilt without going over the top. She loves her husband, but she’s both bewildered and angered by his obsession with saving this outlaw’s soul. She can’t believe he’s willing to put his wife and child at risk to offer a thief a chance at redemption. Cinematographer Bud Thackery’s low-key naturalism makes the settings seem as real as the performances. Witney tends to film the scenes in long shot, moving the camera in a fluid, unobtrusive way to follow the action or re-frame the composition. This movie is beautifully understated, never pushing the drama at us, instead allowing us to watch it unfold. It will come as no surprise that the outlaw does find salvation at the end. And in the tradition of the best westerns, the movie shows it through action instead of explaining it in words. 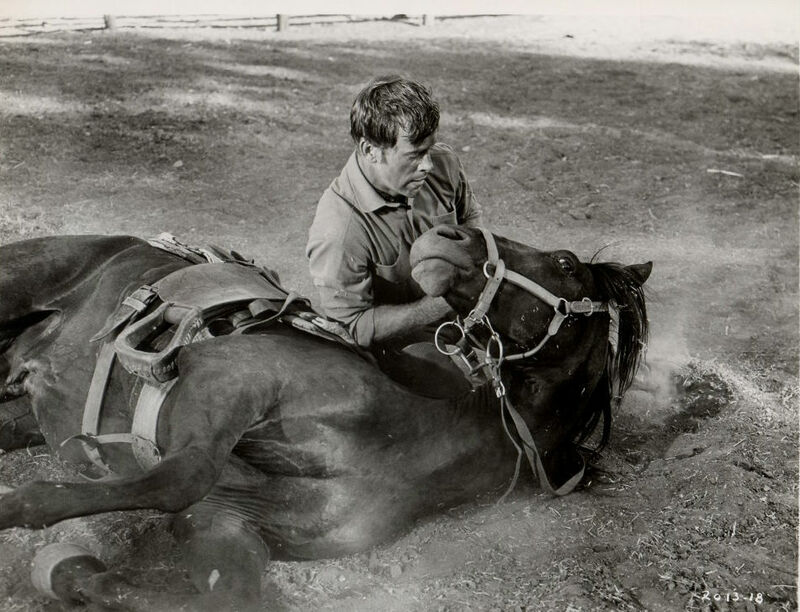 Fatally wounded, this man who fought all attempts to save his soul mounts his horse and rides to the church that the preacher has been building. Arriving at the site, he staggers inside and dies beneath the cross. Is it subtle? No. Is it powerful? Yes. Witney takes advantage of the genre’s chief virtue, which is that you can say things simply and directly, without having to apologize. When an artist creates a film this honest, this true, no apologies are necessary. Usually the image I post for a film is a screen shot taken from a DVD. In this case, I watched the film on a VHS tape from Eddie Brandt’s in North Hollywood, so the image used here is one of the few stills available on the net. I didn’t think Stranger at My Door was on DVD, but I just found out you can get it from TCM. This is good news, because Witney’s work is little seen, and not always easy to obtain. He deserves to be better known. Posted on March 12, 2015, in Western and tagged Barry Shipman, Bud Thackery, Macdonald Carey, Patricia Medina, Skip Homeier, Stephen Wootton, William Witney. Bookmark the permalink. Leave a comment.